It all began in 2005, when then-fitness student David Rosen created a game for the Macintosh called Lugaru (Wikipedia). David was not very confident that his game of "ninja rabbits" would succeed. To his surprise, it did – so much so that Crytek (makers of Far Cry and Crysis) wanted to hire him. He declined the invitation, wanting to finish his studies. After winning awards in the Macintosh circuit of independent game development, David created versions of Lugaru for Linux and Windows, joining other games he had developed in high school, and founded Wolfire Games. The team currently has 12 members and is working hard on Overgrowth, the spiritual successor to Lugaru. Lugaru is a third-person action game with an emphasis on hand-to-hand comabt combined with parkour movements. The game, which continues to sell as shareware after five years, was acclaimed for its fast and intense gameplay, and drew attention because the player does not control a viking or a space marine, but a ninja rabbit called Turner. Contradicting the stereotype of the animal's peaceful nature, Turner does not seem to feel even a little remorse in cutting the throats of other rabbits (tracheotomy! ), subsequently facing down a pack of wolves – his natural predators – to save his race from slavery. A grim irony, as David Rosen said. In an interview with TAKEitGAME, David said that when creating Lugaru, he did not want a game full of cliches: "If I'd made a game about ninjas, space marines or soldiers, Lugaru would be lost among other games of the genre." David said Lugaru's combat system was inspired by games like Rune and Oni. 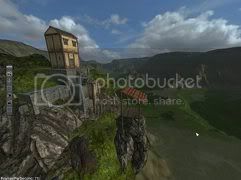 Returning to Overgrowth, Wolfire created an game engine from scratch, called the Phoenix Engine. It was to be much more advanced than the engine used in Lugaru and also extremely "moddable" by players; not just permitting the creation of new textures and scenery, but also characters and various types of animation. Overgrowth is known to have many more game modes and missions than Lugaru, which were weak points of the original game. Besides the usual "kill everything to pass the level" mode, Overgrowth relies on stealth missions, racing against time to reach a certain place and target. A co-op multiplayer mode will also be included, but is not a major element of the game. Rosen says there will be special multiplayer game modes, such as one in which players compete in how many enemies they can defeat before being killed (anyone remember Legolas and Gimli?). There could also be a deathmatch mode, although this has not been officially announced. Another element that has been improved is the creation of three more anthropomorphic races. In addition to the rabbits and wolves present in Lugaru, there will also be mice which excel in the ability of 'stealth'; cats which the choice of intimidation instead of direct fighting; and dogs which can use heavier weapons, and could even engage in direct combat with their enemies. As yet, there is not much information available about the game's storyline. It is however known that the name of the game, Overgrowth, has four meanings within the plot. Those who've finished Lugaru may find one of these meanings pretty obvious. The composer Miko Tarma, responsible for the soundtrack of the PC survival horror game series Penumbra, created by Frictional Games, is also involved in the project. Overgrowth is currently in alpha. David says he does not want to set a release date because he wants all of Wolfire to have the time to do things well - just as long as it does not linger as much as the anime Steamboy, or worse, turn into a novel called Duke Nukem Forever. For now, interested parties may pre-order the game for US$29.95 to experience the Phoenix engine and receive weekly updates of the alpha software, with advice from the editors on creating mods. For more information and videos of the project's progress, visit the Wolfire website and blog, Youtube channel and Overgrowth's Facebook page. Someone needs to convert Turner to Lapism. I doubt Sweetgrass Bloomsniffer would approve of such slaughter. I've been following this team for a while, and not only do I endorse Lugaru and (when it's finished) Overgrowth as a game furries should play, but even as a game everyone should play (assuming one likes combat, that is). The fighting system is simple to start (hold one button down) but very detailed overall (LOL wall kick). I like the way they did health, as annoying as it can sometimes be to be killed so close to finishing a level. I intend to pre-order at some point. Some furry asked them point-blank whether they were furries, and the answer was in the negative, that there were practical reasons for using anthropomorphic animals in the game, the basis for which we'd all agree is valid, but that they are sympathetic towards us for the external crap we from time to time are confronted with (trolls, griefers, etc.). In conclusion, follow their daily blog posts about various aspects of game development, play and buy Lugaru and, if you enjoy the concept and want to see more, learn about and pre-order Overgrowth—you get to play with weekly builds of the custom game engine (which is awesome; go look at the videos). Not understand what you want to say in this paragraph. Well, it certainly has matured, I had a hard time with the first one because it was a bit too animation wonky, and long with the N64/PS1 graphics didn't do it any favors. This one looks alot better. As long as the animations don't make it too difficult to control the character, it'll be golden. Even with the texture improvements?